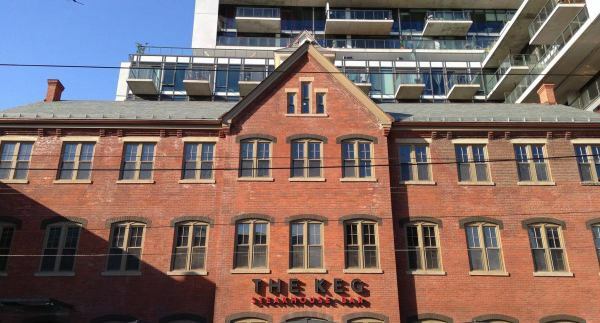 Built in 1882 for James A Watt’s Toronto Silver Plate Company, the building is a classic example of a late 19th century industrial building; 4 story rectangular shaped, red brick cladding, stone trim, and slate gable roof. The company was the first in Canada to manufacture silver plated products and remained in business until 1929. In December 2010, the building was protected by the Ontario Heritage Act. Freed Developments purchased the property in 2009, with the intention of restoring the neglected building into a mixed-use residential and commercial property. Construction of the 12 story, 334 unit residential condominium began in the spring 2011 connecting the past and the present. Structural analysis on the historic building concluded that the original wood framing needed to be replaced with a steel frame to meet Ontario Building Code requirements. Care was taken to restore and preserve the original masonry. Contractor’s faced the challenge of matching the historic bricks. In addition to the new condominiums, the ground floor of the old Toronto Silver Plate Building is home to the Keg Restaurant. In 2014, we supplied 60 squares of our North Country Semi-Weathering Sea Green (18” x 10” x ¼”-3/8”) providing another 100 year life to the Toronto Silver Plate Building. Love the history and photos of this building. Great blog post on slate roofing, thanks for sharing! !